Are you in a fairly new relationship and want to take it to the next level—are you thinking about moving in together? There is no doubt that there are some very attractive benefits to moving in together: the convenience of having your own space to chill and relax, never having to say goodbye at the end of a great night or early the next morning, and the fact it is cheaper and highly preferable to living with your parents or a mate all come to mind. But there are also some negative effects where a relationship is still young and untested. In our ‘I want it and I want it now’ culture, we have lost the ability to wait and need instant gratification. But what do you stand to lose if you move in to quickly? If you are considering moving in with your partner, I expect that you are saying, “Other people might struggle when they move in together, but it will never happen to us. We are so deeply in love. We can’t get enough of each other. Living together would make it just perfect”. But consider this for a moment: moving in too early in a relationship shortens the ‘honeymoon’ period. Remember the excitement, counting the hours, the longing, being deliriously happy just being together and laughing at your partner’s quirks? By cohabitating sooner than later, we inevitably trade the romance for the domestic routine of daily life. Long dinners over candlelight are swapped for quick meals in front of the TV, and finding out about your partner’s excessive cleaning (or lack of) habits can leave you in a bind. In the early, heady days of a relationship, the brain releases a flood of feel-good chemicals, including Dopamine, which triggers specific physical reactions including making our cheeks flush, our palms sweat and our hearts race. Dopamine is the feel good chemical that creates feelings of euphoria, a natural high—effectively making us addicted to the object of our pleasure. While there is an element of unpredictability to the relationship—the waiting, day dreaming, love notes, long conversations over the phone, stolen moments where nothing matters other than that you are together;the brain continues to produce large amounts of Dopamine. As a relationship becomes more fully established and we become increasingly familiar with each other, the brain produces less Dopamine and what was once new and exciting has become familiar, normal and even routine. Don’t get me wrong, I am not advocating that relationships never get beyond the excitement of those early days. In fact, it is necessary that a relationship develops beyond the honeymoon period so you face the world as a couple to establish home, family, career and the other life goals. Just don’t be too quick to get there. Our ‘honeymoons’ are for a moment in time, when life takes on a euphoria like no other and we feel for a moment that, as long as the other is by my side, anything is possible. So, if you are still in the early days of your relationship, don’t be too quick to take it to the next level and move in together. Enjoy the waiting and the longing, enjoy the thrill that comes just by being with the person you love, watch more sunsets together, go for more long leisurely walks along the beach holding hands, celebrate the milestones—one month, two months, six months, and savor the present. 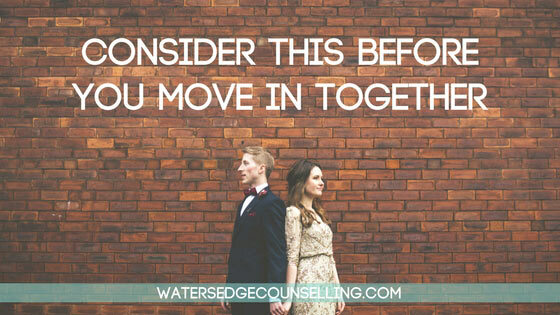 Look out for our follow up article where we explore what else to consider before moving in together. Are you thinking about moving in together’? Do you want to take your relationship to the next level? Do you need the support of a professional to assist you in creating a healthy relationship? Contact Colleen 0434 337 245 for a FREE 10 minute consultation. If you are ready to book an appointment click the icon BOOK ONLINE NOW.